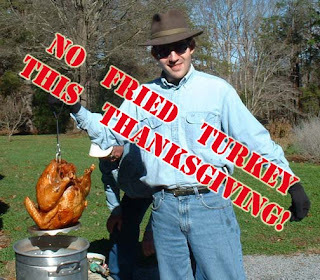 But this will be one Thanksgiving that I'm gonna have to do without my beloved fried turkey. So is everyone else who does this that I've spoken to. I wouldn't mind paying for it but the people around me keep telling me to "save your money". The reason: the price of peanut oil has gone through the roof. When I first started doing this, I could buy a three-gallon container of peanut oil for twenty bucks. Last year it was $25. I was in a meat market yesterday afternoon, one of the best places in town, and three gallons of peanut oil this year is a whopping thirty-five dollars. I always have to buy two containers for my frying needs. I chatted some with the manager and he said nobody is buying any this year... and usually they've done quite a bit of business selling it already. "What's your take on why the price has gone up?" I asked. "Bad biofuel decisions," he replied. Doesn't surprise me. I've been hearing all year that biofuel subsidies have wrecked havoc with cooking oil across the board. And then you factor in that peanut production is down anyway, and the stuff does become a valuable commodity. But the manager also told me that it's the economy in general which is the reason why most people are going back to basted this year. There's not as much free money to spend on what by all rights should be a gloriously prepared banquet to share with loved ones. This was the first sign that really hit me upside the head, that we are in a recession. And there's been a helluva lot worse than "bad decisions" about biofuel going on lately, what with $700 BILLION of taxpayer money that Congress and the Bush White House is doling out with NO oversight. For sure, I don't see the lean times ending anytime soon. I will miss your juicy turkey this year! It amused me that last year's was "Transformers" [especially since I discovered your blog this way] and went back to see waht previous years had been. I was looking forward to reading about the whole process again this year. Hmmmm... off the top of my head, this year it would have probably been either the soundtrack from the HBO miniseries John Adams, or the Gears of War 2 soundtrack (that comes out next week). Jeebus thats a beautifully cooked turkey! You should go into business doing that!